Home » surgery » Why Is a Nosejob Sometimes Necessary to Resolve Nasal Obstruction? 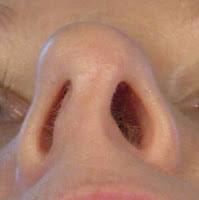 Why Is a Nosejob Sometimes Necessary to Resolve Nasal Obstruction? 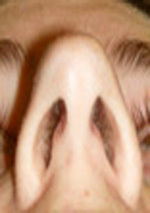 A very common complaint for a patient to see an ENT surgeon is to resolve nasal obstruction. The most common surgeries to resolve nasal obstruction include septoplasty, adenoidectomy, and turbinate reduction. All of theses procedure are performed within the nasal cavity and does not affect appearance. 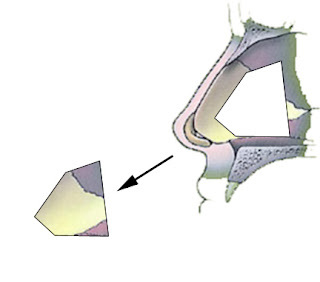 However, sometimes in order to resolve nasal obstruction, the appearance of the nose MUST change especially if the nostril openings are very narrow. By looking at these example pictures of the nostril openings, it's pretty obvious that breathing would be an issue. So even though a nosejob is typically performed for cosmetic reasons, it may also be recommended for medical reasons should nasal breathing be inadequate. For both these patients, the nasal columella is crooked to one side resulting in one nostril opening being larger than the other which causes nasal obstruction on the more narrow side. Correction of this crooked nasal columella into a straight and midline appearance would result in improved nasal breathing as well as a change in appearance. Sometimes the nasal columella may be straight, but the nostril openings are both too narrow leading to nasal obstruction. 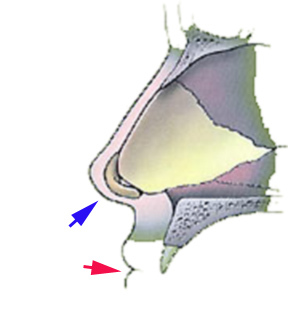 Correction would require enlarging the nasal opening by use of alar batten and spreader grafts which would result in not only improved nasal breathing, but also a wider nasal appearance overall. 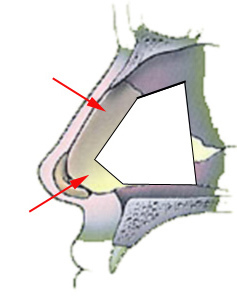 The explanation for why the nasal appearance does not change especially after septoplasty which requires cartilage and bones removal is actually quite simple. The analogy would be a house where the appearance on the outside would not change even though you may knock down a wall between two rooms inside the home. Read more about the septoplasty surgery here.